The focal point of this post is on a document I designed for Marymount International School, Paris. 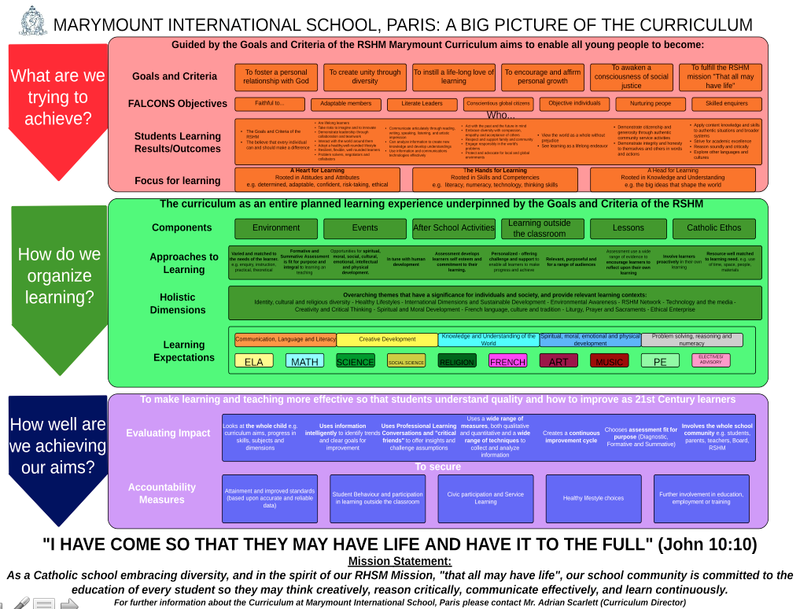 The document is a diagrammatical representation of the “Bigger Picture” of the curriculum at Marymount with an emphasis on its holistic dimension and the fact that the curriculum is “Mission Driven and Vision Led.”Marymount believes that education can only be truly “holistic” if it is rooted in a journey of faith and seeks to foster the growth of the “whole” child. This includes the spiritual and moral dimension as well as the physical and social dimensions promoted in many other international schools. Marymount has a rich and proud tradition of excellence and this is largely due to the fact that the sisters of the RHSM have a clear vision of educational excellence and adhere to the belief that every child matters as an individual created in the image and likeness of God. The “Goals and Criteria” of the Religious of the Sacred Heart of Mary and their faith vision “that all may have life and have it to the full” (John 10: 10) underpin the entire curriculum at Marymount. The “Bigger Picture” of the curriculum therefore is deliberately designed to have the Goals and Criteria as the primary objective that underpins the curriculum that is subsequently structured to fulfill this vision of faith. The expected school learning results (ESLRs), referred to at Marymount as the “FALCONS”, follow on from the RSHM Goals and Criteria and are the mechanisms through which the school lives out our vision. The first objective of the FALCONS is that children are “Faithful to the Goals and Criteria of the RHSM” which reinforces the fact that the RSHM Goals and Criteria underpin the curriculum at Marymount and are central to the life of the community. The other ESLRs refer to the essential 21st century skills that are prevalent in modern education. For example, Marymount seeks to help students to become adaptable and objective learners who develop their critical thinking skills to become skilled enquirers instilled with a lifelong love of learning. 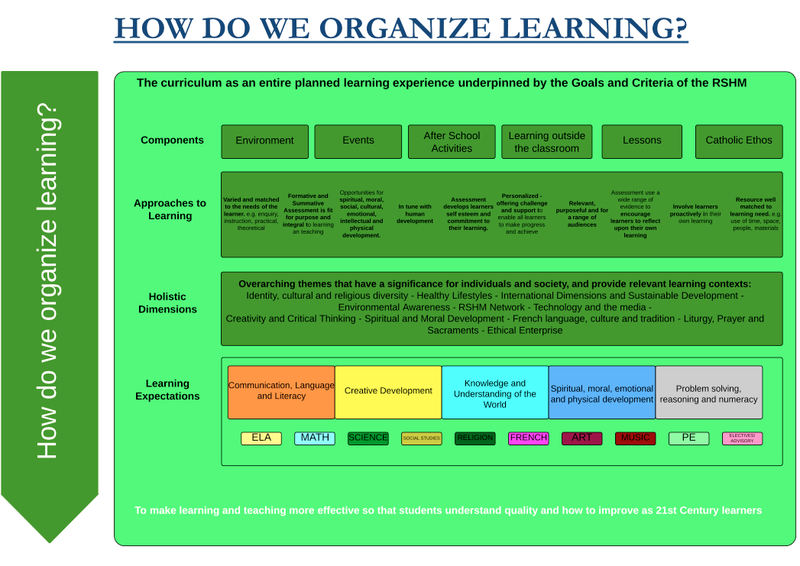 The final of the diagram emphasizes the importance of evaluating the impact of the students’ learning experiences and of accountability measures. Footnote: Whilst the diagrammatical representation ” The Bigger Picture of the Curriculum” is my own work it draws upon the Goals and Criteria of the RSHM and the FALCONS student learning objectives that were developed and implemented by Dr Ron Roukema, the former Head of School at Marymount, Paris. This entry was posted in Uncategorized and tagged 21st century learning, bigger picture, catholic schools, Collaboration, critical thinking, curriculum, curriculum design, curriculum development, education, Elementary School, learning, lifelong learning, marymount, Marymount International School, Middle School, mission-driven, Paris, RSHM, school, Student Learning Outcomes, vision-led. Bookmark the permalink.